Does methanol really dissolve silica during flash column chromatography? Can reversed-phase flash column chromatography be greener? Is there an easy way to purify organic amines? Can reversed-phase flash chromatography purify better than normal-phase? How can I reduce flash column purification time and cost? Flash column chromatography equilibration speed – how fast can you go? How can I perform normal-phase and reversed-phase column chromatography on one flash system? Which injection solvents should I use for reversed-phase flash purification? 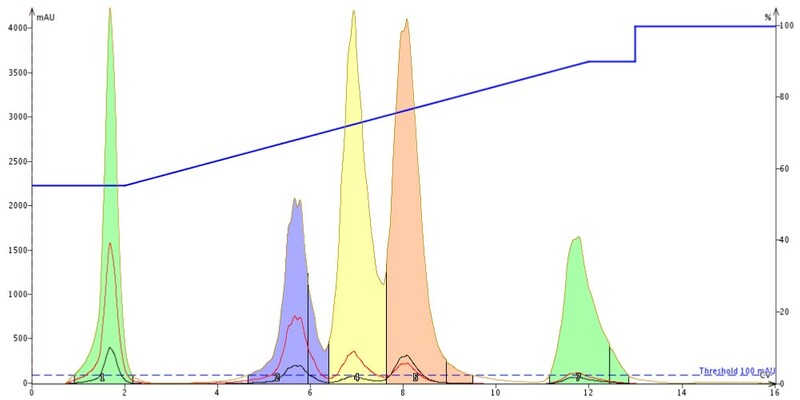 In previous posts I have touched upon various sample loading options and how they impact flash chromatographic performance, primarily in normal-phase flash purification. As the use of reversed-phase flash chromatography has steadily increased over the past few years I thought it would be a good idea to discuss one of the most important factors impacting its success. In this post I discuss the results of some of my original research studying the impact of injection solvent choice on reversed-phase flash separations. Reversed-phase chromatography is typically used when you need to separate several milligrams of relatively polar compounds that either are not soluble in normal-phase solvents or are not compatible with bare silica because they react, stick, or both. If you are currently using reversed-phase at preparative scale, such as flash chromatography, you know the mobile phase limitations – water with either methanol, acetonitrile, or THF – that’s just about it for mobile phase choices. And, like with normal-phase, when it comes time to purify you want your crude sample fully solubilized in the weakest possible solvent at the highest possible concentration. This can be a challenge since with a limited mobile phase selection that includes water, a lot of “strong” solvents are off the table, so to speak, because of miscibility issues or chromatography degradation (as discussed in my normal-phase sample load option post). Choices then? Water comes to mind but most organic compounds are not soluble in it. Using the mobile phase to dissolve your sample can work but at what concentration and solvent/water ratio (you are likely going to use a gradient, right)? Too weak and dissolution is likely poor, too strong and you will likely degrade the separation. So, does that rule out straight methanol, straight acetonitrile, or how about acetone? Well, I have found that at high sample concentrations (~1 g /mL) and with small injection volumes (~0.5% of a column volume), you can get good results. 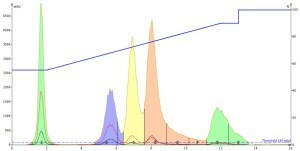 However, if too large of a volume of these reversed-phase dissolution/injection solvents are loaded onto the column, they can disrupt the chromatographic partitioning kinetics, degrade the separation, and reduce sample load and resulting fraction purity – not one of our purification goals. To highlight the importance of choosing the correct dissolution solvent, I developed a reversed-phase method to separate five organic-soluble compounds of various polarities (methyl paraben, butyl paraben, naphthalene, 1-nitronaphthalene, 3,5-dibenzyloxyacetophenone). Five stock samples were prepared at 1 gram of each compound in 5-mL of each of the solvents (~20% solution). The solvents that were chosen included methanol, acetonitrile, acetone, DMF, and DMSO. Each stock solution was diluted 1:1 with the same solvent and the injection size was 0.1 mL; a 12 g Biotage® Ultra C18 cartridge was used for the purification with a gradient starting at 55% methanol and increasing to 100%. For my first run, I injected the methanol-dissolved mixture. The results even surprised me. You would think that a small 0.1 mL injection of a methanol-dissolved sample into a 55% methanol solvent system would work well; it is only 0.6% of a column volume! I certainly did but as can be seen below the chromatography is actually quite poor with substantial peak tailing and low resolution of peaks 3 and 4 (yellow and pink), figure 1. Figure 1. Reversed-phase separation of 50 mg of a 5-component mix using a water-methanol gradient. The dissolution solvent was methanol and the injection volume was 0.1 mL. 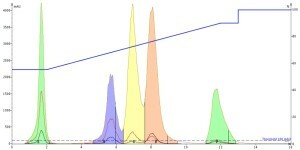 The resulting chromatography is less than ideal with substantial peak tailing and poor resolution. Next, I injected the acetonitrile-dissolved sample. It actually produced better results than the methanol sample even though it is a “stronger” solvent. 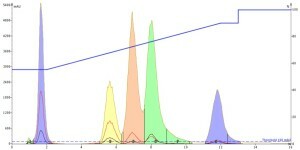 The peaks were noticeably sharper indicating improved mass-transfer kinetics of the solutes during the separation even though the mobile phase is water-methanol. Unfortunately, the improved peak shape did not improve the resolution between any of the peaks, figure 2. Figure 2. 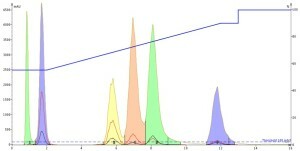 Acetonitrile injection, 0.1 mL, of the 5-component mix shows much improved peak shape with similar resolution between peaks 3 and 4 as with the methanol injection. As mentioned above, I have used acetone in much of my work as it dissolves many compounds at high concentration and is both organic and water soluble so potentially suitable for both normal- and reversed-phase applications. It is, however, quite a bit more non-polar (stronger) than both methanol and acetonitrile which can lead to chromatographic issues in reversed-phase. But because the gradient started in 55% methanol, I decided to include it as well figuring acetone’s increased hydrophobicity would have minimal impact on the separation, especially with the low 0.1 mL injection volume. Well, the acetone injection results were actually better than the methanol injection but not quite as good as acetonitrile as a bit more tailing is evident, figure 3. Intriguing! Figure 3. Acetone injection of the 5-component mix provided improved peak shape vs. methanol but not as good as acetonitrile. I also evaluated both DMF and DMSO as dissolution solvents. These very polar solvents have the ability to dissolve a broad polarity spectrum of compounds. That capability, along with having high boiling points, have propelled their use in peptide and organic synthesis. However, many chemists believe direct injection of these solvents will be problematic for chromatography which is why I added them to this experiment – to see if there are any issues with them as dissolution solvents. Interestingly, both the DMF and DMSO injections show that they improve the mass-transfer kinetics so much that peak tailing is greatly reduced AND the separation is improved as well, figures 4 and 5. And remember, this is just the injection solvent effect at a volume of only 0.1 mL! Also, both solvents elute at the void volume and are clear of any of the other solutes. Figure 4. DMF injection results show both an improvement in peak shape and peak resolution. Figure 5. 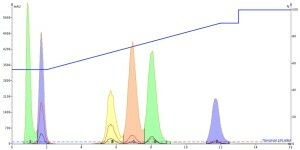 DMSO injection results show an improved separation of the three middle peaks with overall good peak shape. So why do we see these different results? Let’s look at each of the solvents. Methanol, which is part of the mobile phase and gives the worst separation is protic and an Bronsted acid. Acetonitrile, which is aprotic and a Lewis base sharpened the peaks, especially peaks 4 and 5 (1-nitronaphthalene and 3,5-dibenzyloxyacetophenone, resp.). Based just on this information I wonder if the dissolution solvent polarity nature and/or relative acidity is playing a role? Let’s look further. Acetone is aprotic and a Lewis acid (solvent selectivity group VIa, the a indicates it is acidic). 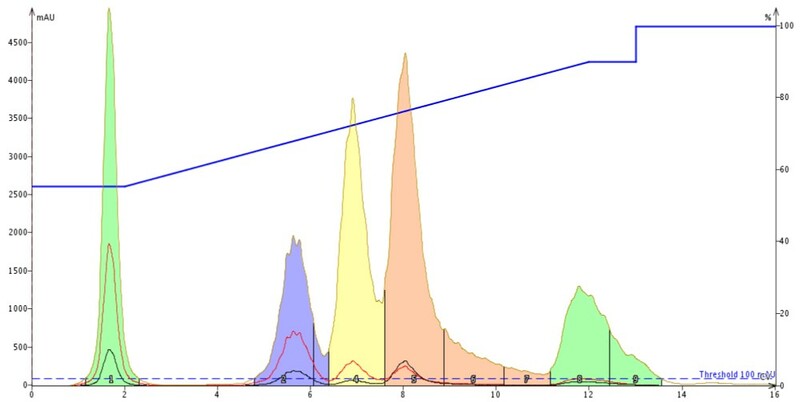 Its chromatographic results were better than methanol (protic acid) but not as good a acetonitrile (aprotic base, solvent selectivity groups VIb) so there may be something to this thinking. But what about DMF and DMSO? Both provided better separations (better resolution) than the other three solvents. Both are aprotic and basic so there is consistency with acetonitrile and acetone (aprotic), but that does not explain the better separation created by both DMF and DMSO. Perhaps these solvents more fully “wet” or solvate the C18 than the other solvents and allow better initial sample component loading (minimized band spreading). Because of the dissolution solvents’ high polarity, the compounds prefer the C18 over both DMF and DMSO. This more concentrated injection volume would explain the improved separation between the compounds. In the course of my research I uncovered the fact that both DMSO and DMF have highly negative octanol-water partition coefficients (Log P) values. The more negative the Log P value the more polar the solvent. With DMSO, the Log P is -2.03, with DMF it is -1.01; both very low and water soluble. If you compare these values to those of the other dissolution solvents (MeOH, MeCN, acetone) you find methanol has a Log P of -0.77, acetonitrile has a Log P of -0.54, and acetone has a Log P of -0.24 – all quite a bit more lipophilic than DMF and DMSO. So, based on this data I surmise the Log P plays an important role in the separation possibly by minimizing the initial bandspreading that occurs with liquid injections. The bottom line is this – if you are using reversed-phase for your purification, look at dissolving your reaction mix in either DMF or DMSO. They are terrific solvents for polar and non-polar compounds alike and can actually improve your purification. For more reversed-phase flash chromatography I invite you to the information linked here. I look forward to your feedback on this topic. Please share your thoughts and ideas for future posts. Very helpful post. Thanks a lot Bob. I have some questions to know. 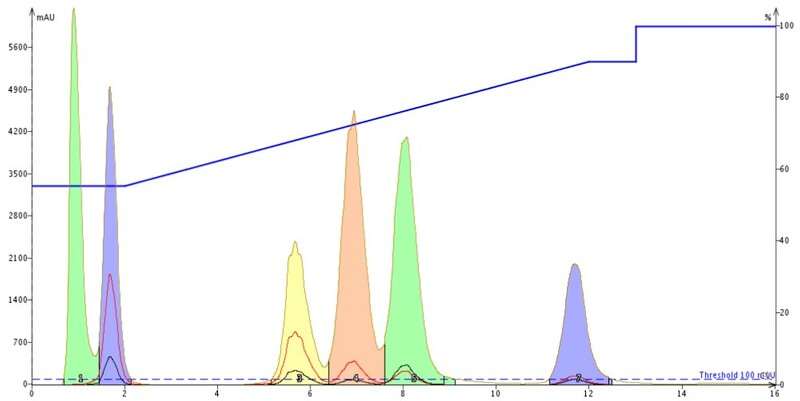 For RP prep column (MPLC/HPLC), if my experimental fraction comes from EtOAC-Acetonitrile, after injecting it dissolving with DMSO; what mobile phase (and what ratio) should I looking for? Thanks in advance. An interesting question, for sure. From your information it sounds like you have a fraction which eluted off a silica column using EtOAc/MeCN and need to re-purify it using RP prep HPLC and have re-dissolved it in DMSO. this compound must be fairly polar so I would try MeCN/H2O stating at 10% MeCN and running a gradient to 100%. If you find early elution of your target molecule, reduce the final MeCN % to 75% and try again. If the target compound elutes late in the gradient, try using a gradient that starts at 25% and ends at 100%. Great post! Thank you for sharing. Hope to hear more from you. Thank you, George. Look for my next post March 8! Pingback: Reversed-phase flash purification. Which injection solvents? Great work Bob– this is very helpful. We like to dry load our compounds on Celite for maximal resolution, but we will definitely try DMF next time for reverse phase flash. I assume that this will also be beneficial for prep. HPLC. Thank you for you kind comments and your question. I recently presented this work with DMF and DMSO at the ACS meeting where quite a large number of chemists said they currently use either DMF or DMSO for HPLC as well as flash so I would try it. Also, I have a colleague here at Biotage who synthesizes peptides in DMF then directly injects that solution onto one of our SNAP Ultra C18 cartridges. Thanks for following the blog and let me know if you have any ideas for blog topics. 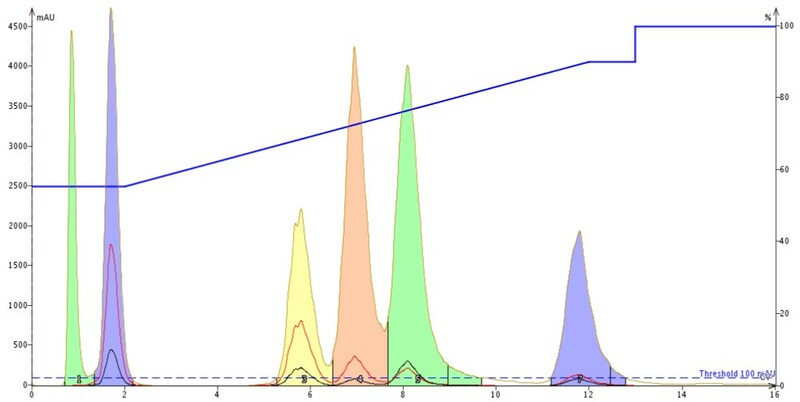 Previous Previous post: Which loading method should I use for purification by flash chromatography? Next Next post: How much DMF or DMSO can I inject on my reversed-phase flash chromatography cartridge?